An approach to health and healing that utilizes the body's inherent and natural recuperative powers. A science that emphasizes the importance of maintaining the structural integrity of the body. A holistic method that deals with treating the cause of the problem rather than just the symptoms. Chiropractic takes into account all aspects of the patient's life: family history, work, stress level, lifestyle, environment, diet and exercise habits. A spinal adjustment is a gentle and precise movement of the vertebra into its correct position. Adjusting the vertebrae can remove irritation and help the nervous system return to its natural function. As a result, chiropractic adjustments support the body's defense system, maximizing the recuperative powers of the body and minimizing the need for more invasive procedures. Although each patient reacts differently, the procedure is rarely painful. It can cause a variety of reactions from temporary soreness to a sense of relief and well-being. Chiropractic treatment is extremely safe. In fact the risk of you being injured is in excess of one in a million. Chiropractic training includes more than five years of courses in anatomy, physiology, pathology, diagnosis, laboratory and nutrition. In addition to their academic training, Chiropractors also participate in an intensive post-graduate internship program. How long can I expect to be under chiropractic care? How long and how often you see a chiropractor will depend on several factors: your age, physical condition, previous history of accidents or surgeries, occupational requirements and how well you adhere to our treatment program. Relief of pain usually happens quickly (within a month), though stabilizing your condition may take longer. This will be discussed with you before you start treatment. Spinal injuries can restrict range of motion, reduce strength, slow reflexes, shorten endurance, and decrease performance. Chiropractic care for these types of injuries has become increasingly popular. Professional sports teams, Olympic trainers, and competitive athletes are employing chiropractic doctors - because they demand results. Whether you golf, play tennis, bicycle, or bowl, the best treatment for sports injuries is prevention. Information about your Nervous System and Subluxations. Your nervous system controls and coordinates every function of your body. It is your nervous system that allows you to adapt to, and live in your environment. A large portion of your nervous system passes through your spine. It is your spinal cord that acts as the major cable exiting your brain, travels down inside your spinal column and branches off into spinal nerves at various levels of your spine. These spinal nerves then exit between individual spinal vertebrae and go to the various parts of your body. To be healthy it is essential that your nervous system function properly and free from any interference caused by subluxations. Subluxations can cause interference to the nervous system at any point along the spine where the nerves exit. This can adversely affect the function of various parts of your body, and ultimately your health. 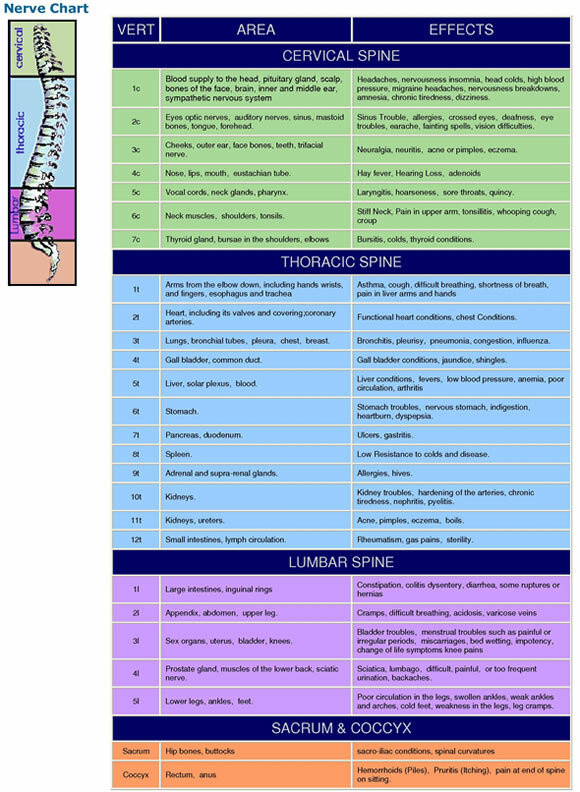 The chart below is designed to give you a look at just some of the relationships between the areas of your spine and your nervous system. Keep in mind that your nervous system is much more complex than can be shown here.